extreme action on 17th and 18th of November, which will become a taking point for the wortd of sport. Jonas Andersson and Erik Edin two key race drivers from Sweden will be representing Team Amaravati. The F1H20 team is actively coordinating With India Xtreme Adventure Activities Private Limited of Malaxmi Group, who are the local partners of F1H20. Due reconnaissance has been conducted in the matters of logistics and planning along with AP Tourism to establish appropriate arrangements with ground plan and layout. Department along with the international team and local organizers explained more about the oncoming race. 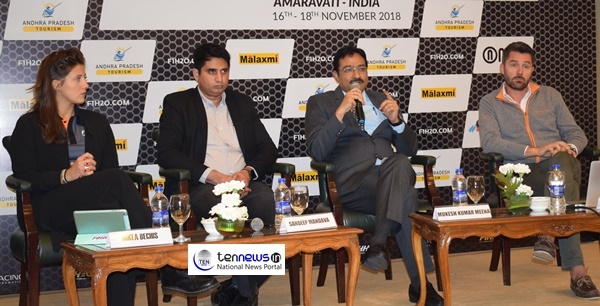 Mukesh Kumar Meena IAS, Secretary, Andhra Pradesh Tourism Department, Marco Pietrini, Director of Logistics, F1H20 and Sandeep Mandava, CEO, India Xtreme Adventure Activities Private Limited gracedthe occasion. Amravati gears up for F1H2O India Grand PrixPower Boat Race in Andhra Pradesh!